Soak the end of bamboo skewers into a glass of warm water for 10 minutes (to keep them from burning while cooking). Mix lemongrass paste, kaffir lime leaves, oil, and oyster sauce in a large bowl. Add sliced beef and mix well. Slide the meat onto the bamboo skewers, ensure the skewer is not exposed between the pieces of meat. Grill at high heat, 5-7 minutes each side. Serve with papaya salad and your favorite cold beer. 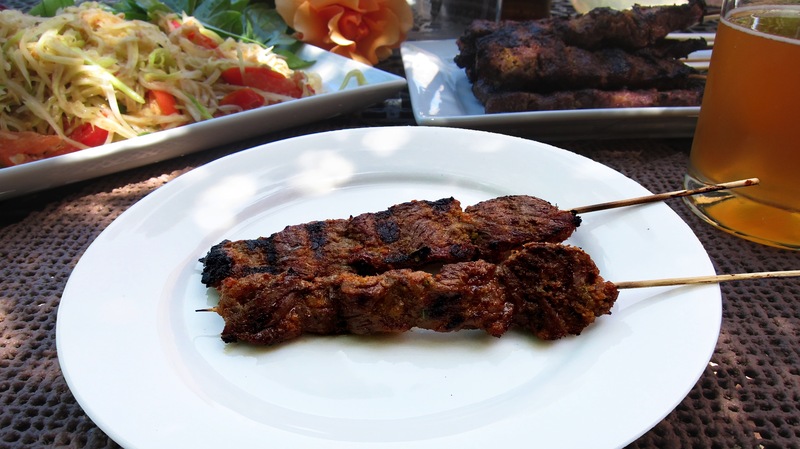 Tip: Skewered meat can be prepared ahead and frozen for future use.